If you’re a Verizon Droid user, and have been dying to get your device updated to KitKat, well looks like you’re in luck! Verizon has updated a handful of Droid devices to KitKat. 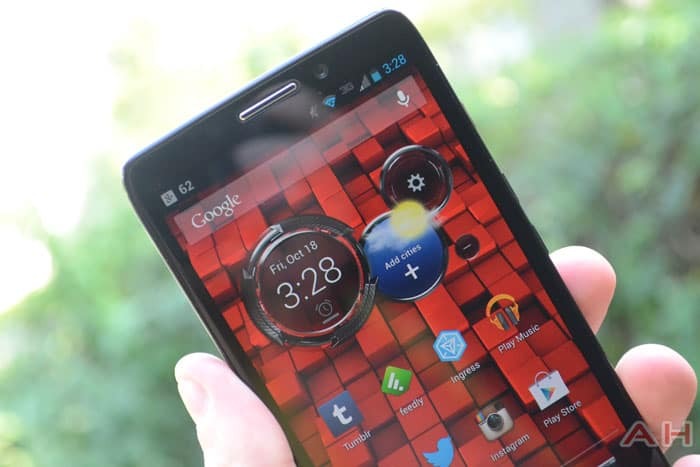 This list includes the Motorola Droid Razr M, the Droid Razr HD, Razr Maxx HD. This will bring the software on these devices up the 4.4.2 (KitKat), and will bring some nice little enhancements to those who are rocking one these devices. One thing that the update will bring is a new full-screen mode for your device. This will allow any app to go full screen, hiding the navigation buttons and the status bar on your device. However with a simple swipe gesture down from the top or up from the bottom you will get either the Navigation bar ( swipe from the bottom) or the status bar (swipe from the top) back. Another great feature that 4.4.2 will bring to Droid Razr devices is color emoji support for messaging services. Now you can have the fun of using color emoji to express what you need to say when words aren’t enough for you. Also you will see improved closed caption support for when you’re watching a video on your device. Improved security is another enhancement you will get in the 4.4.2 update, although this is one you probably won’t see to much of, but will be thankful that it is there. Battery life will be enhanced with smarter power use as well on your device. The battery has been better optimized on in the software, which should give you more juice for the day! Other updates that are being thrown into the 4.4.2 update is WiFi fixes, roaming fixes, and an update to the Droid Zap app, which is a great way to share videos, and photos with anyone who has an Android device. Verizon is also rolling out updates for the Droid Mini, Droid Ultra, and the Droid Maxx. Now these devices are running a slightly older version of KitKat already. However they did tweak a few things that were missing from the original KitKat update. One thing that the update changed was the status bar, which is now the traditional KitKat white instead of blue. Which is a change we have seen come in all other KitKat updates, on other devices. Also, some bugs were fixed and roaming enhancements were included in the update. Verizon is pushing these updates in batches, so it might take a few device for it to hit your device. Now of course you could also check out Verizon’s Forums to see if you can find a OTA Zip file, if you’re brave enough to take the risk, if not, you will probably be better off waiting! Let us know how you’re liking the update once you get it! 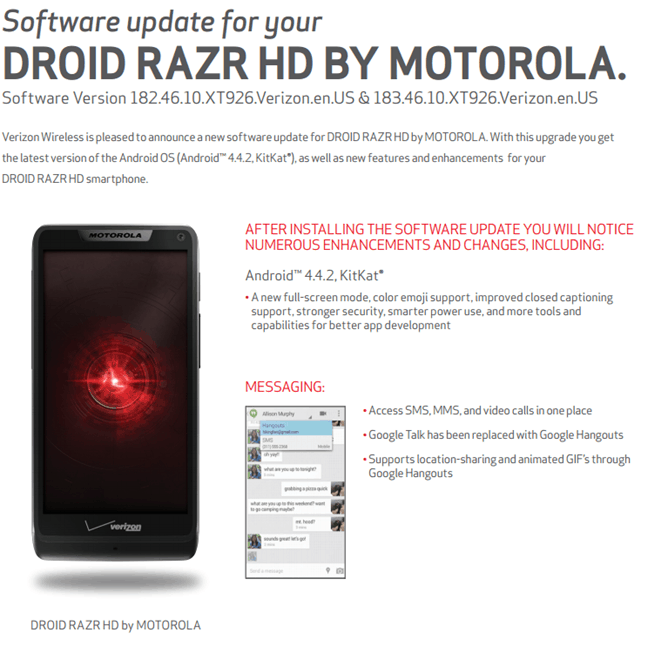 The post Verizon Updates Moto Droid RAZR M, RAZR HD, and RAZR MAXX HD to KitKat, Issues Bug Fixes for Newer Droids appeared first on AndroidHeadlines.com |.